When you touch down in Basco, the provincial capital of the Batanes Islands, the feeling of you being in the northernmost corner of the Philippines is immediate. It’s so quiet. The airport runway is good for small aircraft only. Its terminal, designed to look like a hut, would resemble a boutique shop beside major provincial airports. In the distance looms Mount Iraya, the country’s northernmost active volcano. Standing at 3,300 feet, the summit shrouded in clouds, it dominates the northern end of Batan, the main island. Batanes’ lonely location partly contributes to the quiet life there. It is 160 kilometers from the main Philippine island of Luzon, and sits at the intersection where the West Philippine Sea and the Philippine Sea meet. About 190 kilometers to the north is Taiwan. The isolation is one reason why crime is nonexistent. Offenders have no place to run or hide. Most people know each other. That’s why police officers there have no reason to carry guns. Perhaps the tranquility can be mainly attributed to the quiet ways of the indigenous Ivatan people, who have been around before the Spanish colonizers arrived in the 1600s. They continue to predominate Batanes, numbering about 15,000. Long ago, the Ivatans used to live in homes made from cogon grass until the Spaniards introduced the use of stones in construction, resulting in their now-famous stone houses, designed to withstand typhoons. Isolated as Batanes may be, it was not beyond the reach of Spanish missionary zeal in the 17th century. Just like across the Philippines, centuries-old churches built by the Spaniards dominate the center of town in Batanes. Then and now, life revolves around prayer. With the 10-island Batanes group so far away from everything, its local inhabitants have to rely on fishing, farming and livestock raising for their sustenance. Cows and goats grazing lazily on steep hillsides are a common sight. “Here in Batanes, as long you work hard, you will not go hungry,” says Roger Amboy, a hardy Ivatan tour guide. Tourism is the major industry but the islands’ facilities are so limited, Batanes can only accommodate about 10,000 at a time. The airport can load and offload passengers one plane at a time. The roads are barely wide enough for two vehicles to squeeze past each other. Signs saying “blow UR (sic) horn” are fixtures at blind spots, especially along cliffside roads. When vehicles do meet at a narrow segment, the one going downhill has to give way and slowly back up until they find a wide-enough spot to get through. There is hardly any vehicular traffic. However, one must still look before crossing the road because it’s so easy to forget that roads were built for motor vehicles. 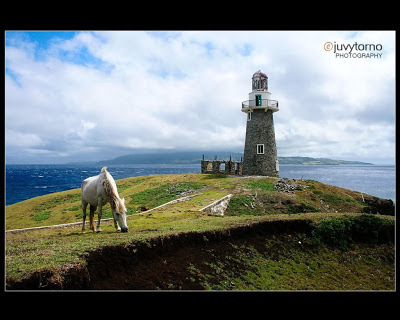 The carefreeness may be excusable because Batanes is simply captivating. It doesn’t fail to draw visitors despite its remoteness. “Almost anywhere you look is like a postcard. No shot is wasted,” says professional photographer Mandy Navasero, who holds “photo safaris” there. Batanes is not for those looking for shopping and night life. It’s for those who want to soak in the scenery and learn about the history and culture of its locals. It creates an appreciation for how the country and its multi-cultural nation was formed. Much of Batanes is so hilly and mountainous that finding flat land is nearly impossible. Even the airport runway has a very slight upward incline. In one moment, you are on a seaside road. A few minutes later, you are negotiating a road that had been cut into the limestone cliff and you are looking down on razor-sharp rocks sharpened by the sea. Or you may be on a road winding through trees, and before you know it, you are already gazing at steep hillsides dotted by cows, goats and carabaos. Or you will discover that you are on a road built on the ridge of a hill and it’s a long way down on both sides. Or you will be surprised to find yourself perched on a mountain rising over 300 feet above sea level, and you are stupefied by the sight of the sea — frothing white — as waves crash into rocky coves below. You can make your way down the slope and see the waves up close, the sound of surf is carried by the wind blowing from the sea and whipping at your face. But the high point of the trip to Batanes may be at sea level, when you take a boat from the main island of Batan to Sabtang Island to the south. Most boats in the Philippines have outriggers made of bamboo because their hulls are narrow and are designed for cruising over relatively flat water. But in Batanes, swells reach from five to ten feet on a normal day and can snap outriggers. So the boats there have wide rounded hulls to enable them to ride the waves. And the higher the swells, the more exciting and wetter the ride. Batanes’ rustic and rugged setting appeals to those who want to get away from the noise and rush of modern city living. It is not your usual idea of a beach destination. It is a place where one communes with nature — a place to savor peace and quiet.